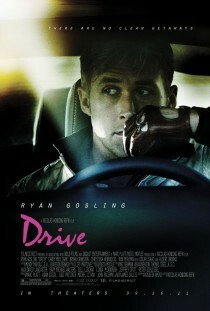 Drive, starring Ryan Gosling, is a slick neo-noir crime thriller and an original experience. On the surface it looks like just a stylish action film but Drive places character development above action. The result is a film where we care about the protagonists and understand what motivates them. The direction is very interesting and won Nicolas Winding Refn the Best Director Award at the 2011 Cannes Film Festival. The film’s sequences are somehow dream-like; the action evolves slowly. The actors often interplay without narrative, allowing their faces to speak volumes instead. This film definitely has a different feel to it. Drive plays out on a backdrop of 1980s synth pop. This should be jarring but it works brilliantly. It is Winding Refn’s nod of acknowledgement to the action movies of that era and also to Los Angeles – where the film is set – a city which never truly left the 1980s behind, he believes. Ryan Gosling plays an ultra cool character in the vain of Clint Eastwood in his Spaghetti Westerns or Steve McQueen in Bullitt: a man of few words, and outwardly few emotions, with a toothpick constantly in his mouth. It is reminiscent of Eastwood chewing on his cigar, playing the Man with No Name. Gosling’s character in this film also has no name. It took us two viewings to “get” what this film is about. It was well worth it. Drive is a superb movie. Ryan Gosling has been my absolute favorite for a few months now, and i have made a point to see almost everything he’s been in. In my humble opinion, he’s brilliant, and one of those amazing chameleon actors… and actors’ actor for sure. This has been the favorite so far, but i have to admit Lars and the Real Girl is not only my next favorite… it’s also a great way to check out his scope. The contrast of these two films is basically breathtaking. I do a little Movie Madness section on my blog too…. so check it out sometime. I was just reading about this movie last night, wondering if I should go out and buy it (I live in Accra so getting a movie means spending hours waiting for it to download (I use a modem, not wireless at home) or going out to a street side movie seller- they surprisingly have SO MUCH) and now I definitely will! Love this site- will help when I’m wringing my hands on what to see! A good film, I agree, and Ryan Gosling is also excellent in George Clooney’s The Ides of March which I saw a few months ago. Drive looks amazing. I’m always fascinated by the portraits of cities, so this will be a ‘bonus’ for me. Drive was incredible fun, and impeccably made! Nicolas Winding Refn is one I’ll seek more films from. Great review. Incredible movie, constantly recommending this film too people! I just found your site and I love it!!! I do not get this guys’ huge appeal. I liked him in fracture, and I crazy stupid love. Young actors today seem to think that showing a blank face and being silent qualifies as acting. I like, you know, acting? lol. I liked this movie, but was not blown away by it. ps. thanks for following my blog. I like Ryan Gosling and “Drive” sounds like my kind of movie. The first one I watched of him is “My Blue Valentine”. That is one huge depressing movie. Have a few movies starring him that I have not watched at home. Will have to do that soon before I get “Drive”. I saw this movie on Netflix. Afterward, I knew why I drove it off my list of movies to see. This movie had all the excitement of sticking a stick in your eye. Horrible, just horrible. We weren’t really sure if we liked this film or not after the first viewing. It was so contrary to expectations – even though we don’t try to have them here at Wonderful Cinema. We were left with the feeling that there was much to dislike yet a strong inclination that if we messed around under the bonnet for a while and tried to understand what the director was trying to do, we might get more out of the experience. We went away, read some articles on Nicolas Winding Refn and Ryan Gosling – neither of whom we knew at the time – and upon a second viewing – when we knew more or less what to expect – we loved the film to bits. Drive has a very different feel to it than other films in this genre. It’s almost like a dream sequence from beginning to end. It’s a well-paced, slow film with a lot less dialogue than the norm and a lot more emphasis on the actors faces, who give away very little. For us, that translated into a very cool experience. But, as we all know, horses for courses! “Drive” was a unique experience for us. In the 81 films we’ve reviewed so far, this is the first time we hadn’t formed a solid opinion after a first viewing and the first time we researched a film after the first viewing specifically with a view to watching it again. I couldn’t understand why the film was called Drive when there was only 2 car scenes (maybe 3 if I remember correctly) not very car orientated that’s for sure, I guess that’s why I didn’t like it much. Non the less I do like how your review is short, yet still provides enough insight. It’s amazing how this film manages to divide opinion. I loved it in the first sitting. The first third of the film felt – to me at least – a little like an 80s John Hughes movie, if filmed by Michael Mann. Then the movie changes radically and in completely arresting fashion. As a consequence I’ve loaned my copy out several times and received reviews that range from ‘awful’ to ‘mind blowing’. Hmm, the film was very hyped in Singapore too, but I did not quite get it. Maybe, like you, I need a second viewing haha. I really enjoyed this movie, mainly because it was the first time I had seen the much hyped Ryan Gosling act. The soundtrack set the mood straight away and the 80’s electro feel got me interested during the relatively slow start – as you say it works brilliantly. Then after the ‘point of no return’ I was just hooked! Great film and interesting to read your take on it. I love how so much is conveyed with so little dialogue. I enjoyed this movie a lot and you’ve reminded me that I should take another look at it. Some of the finest lighting I ever saw. Interesting that you say you had to watch it twice to ‘get’ it – I watched it and completely didn’t get it, thought it was very slow-moving and filled with long, awkward silences but will definitely be giving it another go after reading this. Good review of one of the best movies of recent years. This movie and Blue Valentine really made me respect Ryan Gosling as an actor. Drive is an amazing film. Here is my review.